As part of the Johnson & Johnson Family of Companies, the values that guide our decision-making are spelled out in Our Credo. Put simply, Our Credo challenges us to put the needs and well-being of the people we serve first. Our Credo was crafted in 1943 by Robert Wood Johnson. This was well before people spoke of "corporate social responsibility." Our Credo is the moral compass that guides our responsibilities as a citizen of the world. We draw on Our Credo in decisions made every day at every level of the company. Our Credo is a living document and is reviewed to make sure that it meets the needs of our patients, the public, our employees, our communities in which we live and work and our stockholders. However, the spirit of the document remains the same today as it was when it was first written in 1943. 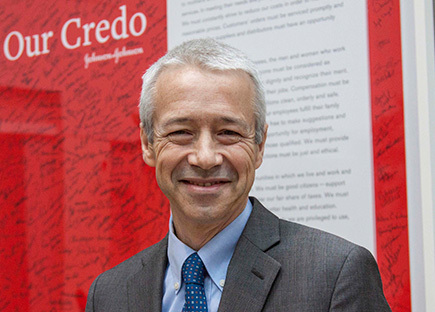 To learn more about Our Credo, please visit Our Credo Values on the Johnson & Johnson website. We are responsible to our employees, the men and women who work with us throughout the world. Everyone must be considered as an individual. We must respect their dignity and recognize their merit. They must have a sense of security in their jobs. Compensation must be fair and adequate, and working conditions clean, orderly and safe. We must be mindful of ways to help our employees fulfill their family responsibilities. Employees must feel free to make suggestions and complaints. There must be equal opportunity for employment, development and advancement for those qualified. We must provide competent management. We are responsible to the communities in which we live and work and to the world community as well. We must be good citizens — support good works and charities and bear our fair share of taxes. We must encourage civic improvements and better health and education. We must maintain in good order the property we are privileged to use, protecting the environment and natural resources.